EghtesadOnline: Bulls returned to Tehran Stock Exchange on Tuesday as the benchmark TEDPIX gauge closed up 5,662.12 points or 3.23% at 180,847.6 points. It marked the first gain for TEDPIX after five consecutive losses had left it 20,000 points away from its historic high of 195,104 points achieved on September 30. The rally, ongoing from late summer, led to a horde of investors flocking to the stock options in hopes of quick gains that indeed led to speculative bubbles in prices of stocks. The subsequent corrections acted as wakeup call for inexperienced investors whose portfolio choices were not backed by economic wisdom. But as reported by Donyaye Bourse website, the tides turned in Wednesday trade as demand shifted toward stocks with more value, according to Financial Tribune. Demand was particularly high for oil refinery, petrochemical, mineral and metal stocks. These stocks have been most coveted by veteran investors, evident in company earnings report that show they have made handsome profits in the wake of the rial's slide. On Tuesday, the US dollar's exchange rate crossed the resistance level of 150,000 rials. The Iranian currency has approximately lost 75% of its value against the greenback in the past six months. 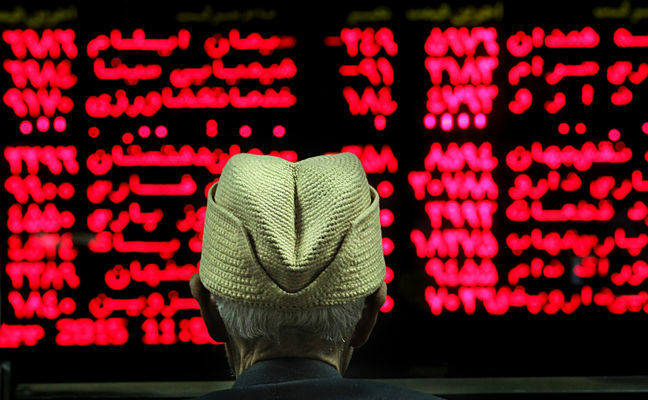 Tehran Stock Exchange’s main index gained 5,662.01 points or 3.23% on Tuesday to end trading at 180,847.5. About 5.35 billion shares valued at $129.15 million changed hands at TSE for the day. Behran Oil Company was the biggest winner as its shares went up 7.31% to 9,295 rials per share. Qazvin Sugar Co. incurred the biggest loss among all TSE-listed companies and went down 9.66% to 7,082 rials per share. Mobarakeh Steel Co. gave the biggest boost to the benchmark index, followed by Persian Gulf Petrochemical Industries Company, and Iran National Copper Industry Company. Iran Khodro was the biggest laggard behind the benchmark's fall, followed by Eghtesad Novin Bank, and Iran Aluminum Company. The Price Index gained 1,654.89 points to close at 52,855.9. The First Market Index was up 4,478.58 points to post 136,776.6. The Second Market Index grew by 9,800.64 points to reach 343,150.6. The Industry Index went up by 5,507.32 points to register 164,155.3. The Free Float Index was up 5,604.67 points to hit 194,085.60. The TSE 30 went up 359.66 point to settle at 8,957.6 and the TSE 50 ended 309.88 points higher to finish at 7,860.4. Iran Fara Bourse’s main index IFX gained 49.47 points or 2.5% to close Tuesday trade at 2,030.96. About 1.88 billion securities valued at $49.29 million were traded at the over-the-counter exchange for the day. Esfahan Steel Company had the highest number of traded shares and trade value as 550.69 million of its shares worth $12.97 million were traded. Kish Parsian Electronic Commerce, Rail Seir Kowsar Co, and Iran Cultural Heritage and Tourism Investment Group Company registered the highest value increase. Mah Taab Kahnooj Electricity Generation Company, Iranian Investment Incorporation, and Zangan Zinc Industry Co. suffered the biggest decline. Marun Petrochemical Company, Zagros Petrochemical Company, and Middle East Mines Industries Development Holding Company had the most positive impact on IFX. Caption: About 5.35 billion shares valued at $129.15 million changed hands at TSE on Tuesday.